One of my favorite lunch spots happens to be just a block away from my office. I love Between the Bread. Gourmet To Go is right! It can be a little pricey for an every day lunch meal – the salmon meal with the 2 sides comes out to $15.19 with tax, but I find the flavor and quality to be well worth the price. The chicken meal is less expensive, but I ALWAYS get the salmon. I go to Between the Bread as often as I can rationalize haha. The portions are huge, so you could definitely try to stretch it to two meals… but I have a hard time doing that because it is so delicious! They serve seasonal items so every thing is always fresh and on season. I think of myself as lucky to be able to eat the food from this place, since they are really mainly a catering company, although I believe this may be changing with word of them opening up 2 more locations. You have to look carefully for the storefront because it is kind of small, you could almost miss it. There are 2 things that make it easy to find – their little chalk board that they put right outside the front door with the daily proteins that they offer, as well as the line coming out of the door (which is always a sign that a place has great food) but don’t worry, it goes quickly!! I promise. Don’t completely count on the line to find it though. People have started to line up on the inside now. Once you get to the front of the line you will come to a counter that has all of the delicious proteins for the day laid out. From shrimp, to chicken, to mahi mahi covered in an avocado salsa and of course the herbed salmon every time. Next to that is a case full of all of the side salads you have to choose from. The flavorings are complex, well thought out and well seasoned. I’ve even gone here on occasion for just for plate of the sides, that’s how good they are. Most people that go there are regulars and pros at Between the Bread ordering, so try to have your selections ready when you get to the counter! Everyone on line is hungry and trying to get back to work! Thankfully no matter what it seems that they always have my favorite combination pretty much any day of the year – the herbed salmon, corn salad and kale salad. I wish I knew how to make the herbed salmon and kale salad at home. Maybe one day they will give me a lesson?! The salmon is so flavorful and always moist. The kale salad is so simple, yet I can’t seem to figure out how to recreate it. All I can tell is that it is kale, apple, craisins and pumpkins seeds, the dressing I am not sure of. The guys that work here, I believe their names are Luis and Erwan, are awesome. They keep it moving and keep it friendly, which is much needed in midtown, NYC, for sure. 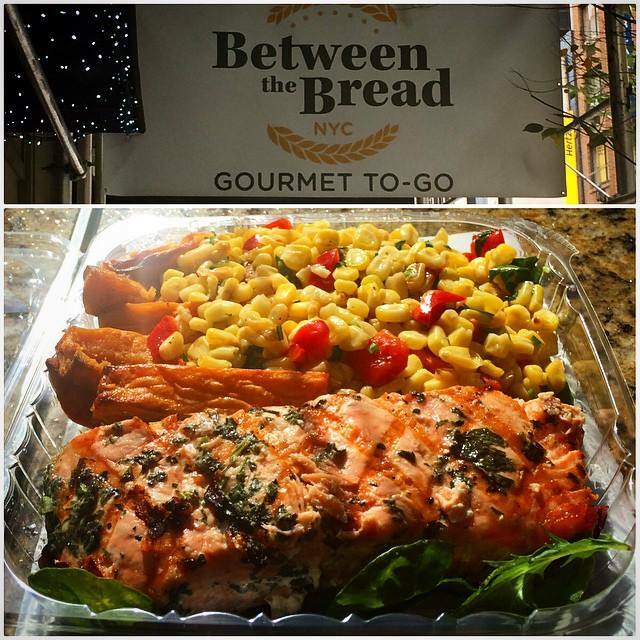 Between the Bread is located at 145 W 55th St, New York, NY 10019. Reach them by phone at 212-765-1840. Their hours are 7am – 4PM. I highly recommend checking this place out. Everything is fresh, delicious, and most of the things they serve are healthy. I have yet to try out their sandwiches but they look pretty damn tasty. 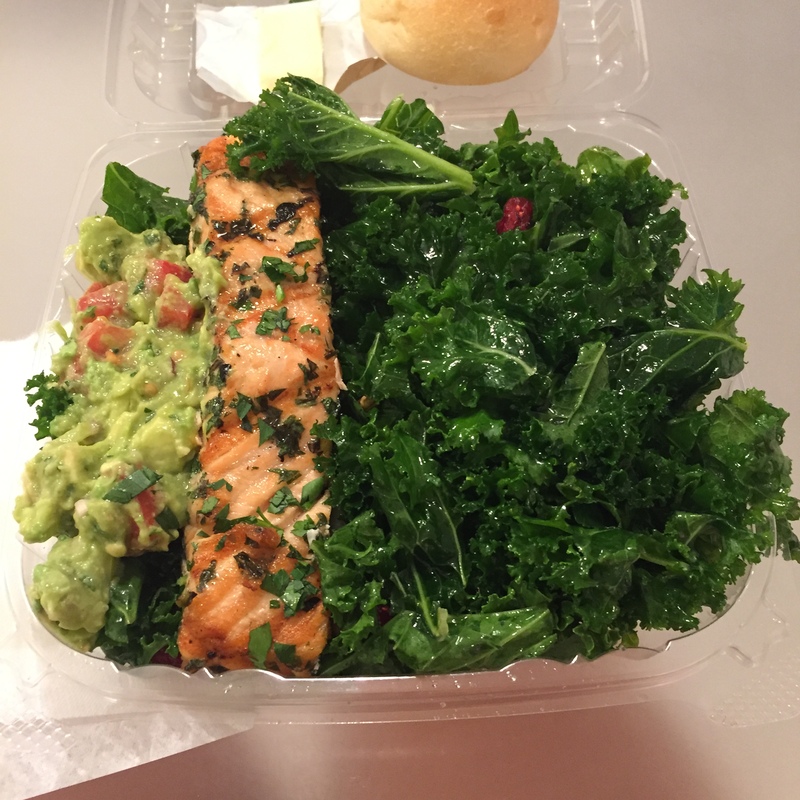 Between the Bread – Midtown – NYC – Mojito Salmon with double Kale Salad and Guacamole – I love that if they have guac as an option sometimes… and it is just a dollar to add a scoop!